Tomorrow is the day! We will be having our Sew a Jelly Roll Day event all day tomorrow. We have a couple seats left for the Jelly Roll Race contest. You could win a free Jelly Roll! 1. An UNOPENED Jelly Roll. 2. A good working sewing machine. 3. Thread with a couple of prewound bobbins. That's all you'll need! If you don't have a Jelly Roll, we have just gotten in 50 new Jelly Rolls!! You're sure to find one you love. There will be two additional games with prizes and food while it lasts! This is going to be so FUN!! Race begins promptly at 10:00 a.m. Stop in early to get set up. There is only ONE spot left for the Mystery Block of the Month. Hurry in to sign up for this lap-sized quilt featuring the fabric line Authentic, Etc. Seriously . . . hurry! Spots are filling up fast! 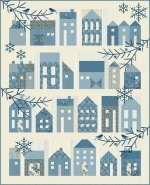 Don't delay in getting your spot for this B E A U T I F U L block of the month designed by Edyta Sitar. You can jump in! We have a couple spots left. This one is fun, bright and happy. Simple piecing and a queen-sized quilt sure to brighten any room. We know you've seen those wonderful, touchably soft kits when you walk in the door. Well, guess what. They are almost gone! If you see something you like, you better grab it. 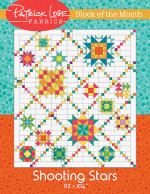 We won't be ordering any more of what you see as we will be bringing the new kits back from Quilt Market. Don't wait to get the one you love! Sssshhhh! Judy's going to Quilt Market so Betty is inviting you all to the shop for a Quilt Retreat. Beginning Friday, October 27th at 3:30 p.m. and sewing until 9:00 p.m. Then on Saturday, we will continue at 9:00 a.m. and sew until 6:00 p.m. Cost is $30 and includes lunch on Saturday and some fun give-aways! Space is limited, so sign up soon!